Mrs Bimla Misra, who breathed her last on 12th September 2013 at the age of 84 years, is an example of living and dying with dignity and grace. True to her profession of an educationist, she taught her students till one month before her demise, and then donated her body to the cause of medical education to King George's Medical University (KGMU), sans any rituals. Despite her crippling arthritis, she preferred to live all by herself (away from her 3 children), defying the age-old traditions and 'ageism' stereotypes. It was difficult for anyone who came in contact with her to not get infected by her beaming smile and her positive attitude towards life, making little of the numerous problems that can beset anyone of her age. She taught not only English but also how to persevere in the face of adversity; how to find joy in sorrow; and how to live life to its fullest despite all odds. To commemorate her legacy and inspiring life, we humbly dedicate our annual Health Fellowship Programme to her with the intent that the values she upheld will guide us. Her life will inspire the Fellows to have their say with courage, integrity and conviction on issues that matter most to them in the struggle to achieve health and gender justice, so do we believe. 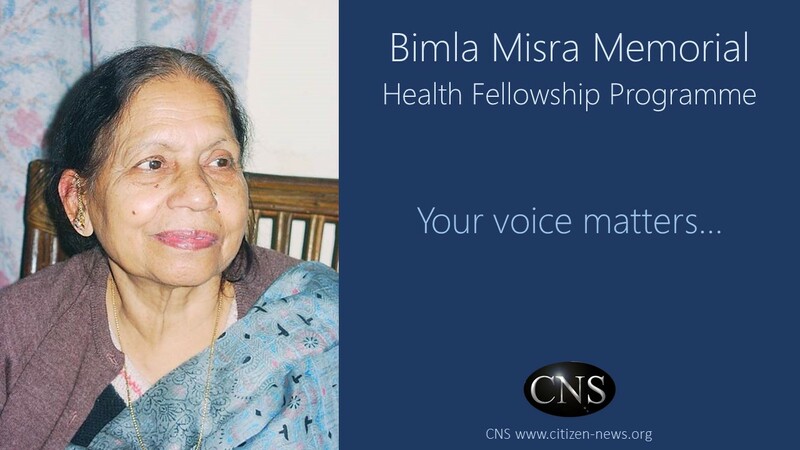 Know more about the annual Bimla Misra Memorial Health Fellowship Programme hosted by CNS, to help support people in low and middle income countries in having their say on issues that matter most to them in the shared struggle to achieve health and gender justice.